Locking cabinet features one adjustable steel shelf. 8 3/4" high open storage area. 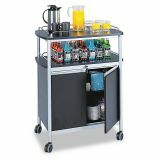 Safco Mobile Beverage Cart, 33-1/2w x 21-3/4d x 43h, Black - Sleek cart is designed for use in lobbies, conference rooms or boardrooms. Top shelf holds 25 lb. Melamine top is 33-3/8 wide x 21-5/8" deep with 1-1/2" high chrome wire rails to prevent items from falling off in transport. 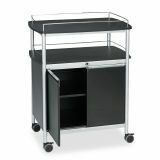 Spacious locking cabinet has one adjustable 29" wide x 16-1/2" deep steel shelf. Open storage area is 8-5/8" high. Shelf in cabinet and on top of cabinet holds 50 lb. Frame and cabinet are made of steel. Top and doors are made of melamine. 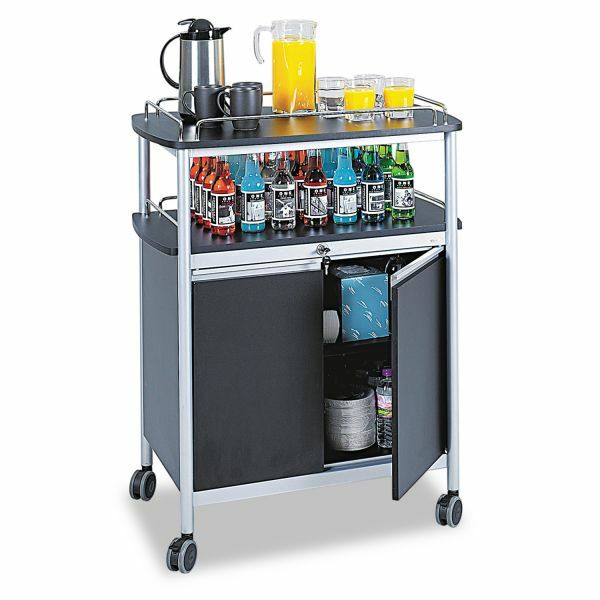 Easily roll cart on four 3-1/2" casters (two locking)." 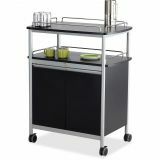 Metallic Gray steel frame, black steel cabinet with black melamine doors.